Who says you can't see the world if you stay at home? While you can't experience the world, you sure can see it and have a decent simulation of lots of interesting places from the comfort of home. Thanks to major innovations in the last decade, virtual reality recently went from clunky 90s gimmicky fad to hey-this-thing-might-actually-be-cool-now status. Mix VR together with other technologies such as Photogrammetry and 360-degree video capture, and suddenly you can virtually travel to destinations all over the world and beyond without ever leaving your couch. 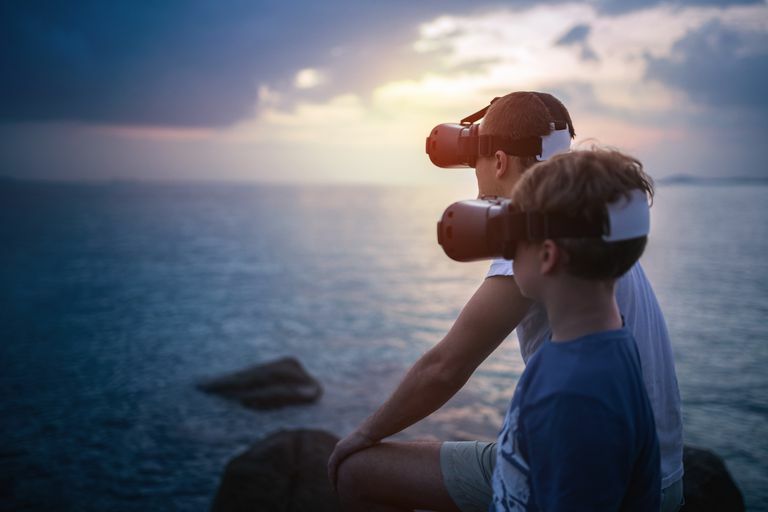 We’ve tested and curated some of the best VR tourist destinations and experiences and have come up with what we believe are the top VR travel experiences. Excellent visual and sound quality. This tour lets you sit in a virtual motorized kayak theme-park type ride through The Grand Canyon. You tailor the tour to your preferences by selecting either a sunlit or moonlit experience and by controlling the speed of the ride. While you cruise along, you'll enjoy the sights and sounds of procedurally-generated artificially intelligent wildlife. You can even attract and feed the virtual fish as you navigate the waterways. The ride is on rails (meaning you can't steer the kayak at all), but you can stop at various points and enjoy the scenery by utilizing the throttle speed controls of your motorized kayak or by exiting the kayak at scenic rest stops. The tour is short and there is no historical background information or anything for history buffs, but it is a fun ride and one that would be great for someone new to VR. It is available from Valve's Steam Store and at the Oculus Home app store. More tours get added to the library. Some back areas of models are unfinished. Available for VR devices only. Some users experience control issues. Realities is a VR travel app that allows users to explore scanned and modeled real-world environments. The environments aren't just 360-degree photos, they are locations that have been captured with specialized scanning equipment allowing for immersive rendering in Virtual Reality. The user interface is a giant globe that you can rotate with your VR controllers. Once you've decided on the place you want to visit, you simply tap the area on the virtual globe and you are instantly whisked away to the exotic locale. One interesting destination available is a prison cell in the infamous Alcatraz prison. Once you arrive in the prison cell you are greeted by an unseen narrator, presumably a former prisoner in the cell next to you, who recalls his experience. It's very museum-like and an educational experience worth having. There are other destinations of varying size and complexity. Hopefully, many more will be added in the near future. You can find the Realities app on Valve's Steam Store. Controls for Vive don't work well. Do you like planetariums? Have you always wished they were much more realistic? I think we’ve all dreamed of riding in a spaceship and exploring our solar system and beyond. Titans of Space 2.0 helps to make this a reality (at least a virtual one). Titans of Space was one of the first polished virtual reality experiences available and one that helped create a lot of buzz about all the potential that VR had to offer. This app provides a theme park-style ride through our solar system (and beyond). It allows the user to control the pace of the experience. Factoids about all the planets and moons are provided throughout your journey, as are distances and other measurements of interest. The sense of scale of the planets and moons is truly awe-inspiring and provide you with a unique perspective that you might not otherwise experience unless you are an astronaut. This app shows off the dynamic power of VR. Titans of Space 2.0 is available on Valve's Steam Store, on Vive Port, and on Oculus Home. Can feel slow and boring. EVEREST VR is exactly what it sounds like it might be. It's an interactive Mount Everest VR tourism experience. When EVEREST VR was initially released, it contained some interesting interactive mountain climbing elements, as well as some great documentary-style vignettes that made you feel like a participant rather than just a viewer. Despite some inventive content, in our opinion, this experience was over-hyped by other online tech sites that reviewed it when it was first released. Some users who purchased this experience felt that It was also priced too high for the amount of content it initially contained. Thankfully, the creators of EVEREST VR listened to the constructive criticism of those who purchased the app and were disappointed. They ended up dropping the price and added a lot more interactive climbing-related content to make the app a much better value. If you're into mountain climbing but don't like the whole possible death and frostbite aspects of it, give EVEREST VR a try. EVEREST VR is available on Valve's Steam Store. Do you hate those velvet ropes that they put in front of all the most valuable paintings in museums? Do you wish you could get a closer look without battling the crowds or setting off an alarm? If you've ever wanted to peruse a museum at your own pace with no limits on how close you could get to the artwork, then The VR Museum of Fine Art is for you. With incredibly detailed scans of some of the world’s most famous paintings and sculptures, this free app holds some amazing educational value. You can see the brushstrokes of Monet’s Water Lilies or take a 360-degree tour of Michelangelo's David. This is an art lover’s delight. The experience really makes you feel like you're at a real museum. They've even thrown in a fancy little pamphlet map for you to carry with you to help you navigate your way around the exhibits. Pick up this app at Valve's Steam Store and get a heaping dose of culture. Can get slow and boring. More of a demo than a full game. Have you ever wanted to stand on the deck of a sunken ship while a gargantuan whale swims by you, looking you straight in the eye? Maybe swimming in a sea of bio-luminescent jellyfish is more your style. You can do this and more without having to invest in expensive scuba equipment or diving classes, or even leaving your living room for that matter. theBlu is a collection of virtual reality-based underwater experiences that make you feel like you're literally in the tank of a huge aquarium exhibit. The level of detail in this app is amazing and the sense of scale (especially during the whale encounter) is jaw-dropping. theBlu is available on Valve's Steam Store, on Vive Port, and on Oculus Home. Valve, the gaming behemoth company responsible for games such as "Half Life," "Counter-Strike," and "TF2," has yet to release a major first party VR title despite them being a major driving force behind VR. Despite not yet releasing a full-fledged VR title, they have released some remarkable tech demos. Valve’s first VR tech demo, a collection of VR mini-games and experiences called “The Lab”, is an excellent showcase of different types of Virtual Reality gameplay. The Lab was intended to both inspire VR developers and also serve as a tutorial for new VR users. Shortly after The Lab was released, Valve released another free and experimental VR title called Destinations. Destinations allows you to walk around and virtually visit various developer and community-created virtual locations. These destinations can be facsimiles of real-world locales, such as London's Tower Bridge, otherworldly places such as Mars (complete with scanned terrain from NASA), or completely made up destinations including a virtual museum devoted to the game "Skyrim." Valve has added social elements allowing users to visit other users' creations and has even created a few game-like destinations to foster social VR gaming. It will be interesting to see what Valve adds in the future and what the user community builds as well. Destinations is available via Valve's Steam store. Can be slow to load. We all remember when Google Earth was released many years ago, everyone marveled at the novelty of being able to find and view their house from satellite imagery. It was a bit unnerving though, knowing that these images are being taken all the time and are fairly well detailed. Once the novelty of Google Earth wore off, we all went about our business, that is, until Google Earth VR was recently released. Google had already taken the VR world by storm with their amazing VR painting tool known as Tiltbrush. Tiltbrush is the MS Paint of VR, but much more mesmerizing and a whole lot more fun. Not content to rest on their laurels after Tiltbrush, Google dropped Google Earth VR on the world and blew our collective minds. Google Earth VR lets everyone not only see their house from Space, but allows you to virtually fly to it and stand in your front yard or on your rooftop (if that's your thing). Google Earth VR gives you god-like powers such as the ability to change the sun’s position at will or to scale things to pretty much any size and fly around. Feel like stabbing yourself in the eye with the top of the Eiffel Tower? Google Earth VR can make that happen for you. There are hours of fun to be had flying all over the globe like you're Superman. The detail levels depend on where you're trying to view. Tourist destinations are likely to have much more highly-detailed geo-spatial imagery than rural areas. There is a ton to see and Google offers some virtual tours to help you get started. This is a must-see app on Valve's Steam store. If your worried about nausea from the flying around part, fear not, Google has added several “comfort features” to prevent virtual travel sickness. As Virtual Reality technology improves, expect more immersive travel and tourism experiences in the not-too-distant future.